Last week on friday, I gave a Tech Talk about Open Source Gaming as part of Leslie Hawthorn’s “Open Source Developers @ Google” talk series. For those who were silly enough to miss it, it should be soon coming to a YouTube near you. I had given a similar talk at my local LUG only recently, I think that version went a little better but it was quite a different crowd. The first part of my talk came across way more preachy then I had hoped. I also see now how I can better use Thousand Parsec as examples of the tips I came up for releasing FOSS games. I guess practice makes perfect, maybe I’ll get it right to one day be able to give it at Linux.conf.au. At the beginning this time I tried some of the “one word per slide quick succession” talk which Anthony Baxter had suggested. I think however think I ended up just insulting every American! I don’t think I speak fast enough to make this type of talk successful, but I’ll keep experimenting. If you have any feedback on the talk, please do send me an email! The real reason for this post is to upload the slides for the tech talk so they can be linked from the YouTube video. It’s been a hectic week, but I have managed to survive my first week as a Noogler. As everyone knows, I started at Google last week. The first week has been quite hectic as I started at the Sydney office and then in the middle of week flew to the Googleplex in Mountain View, California (if anyone is located in this area and wants to have lunch, feel free to look me up!). The week has been a little bit of a mess for a number of reasons. I’m joining the PSO group at Google which is only just started to establish a presence at the Sydney office, this has meant not a lot of people know what I should be doing. To make matters worse, I managed to arrive for the Memorial Day weekend (public holiday on Monday) which means the normal schedule for training (which starts on a Monday) is all changed. It’s still be very demanding and interesting anyway. I arrived here in San Francisco on a Thursday (before I actually left according to wall time, Yay timezones! )Â and after sleeping for about 18 hours straight managed to make it into the office on the Friday. The jet lag didn’t really end up hitting me until the weekend, so I’ve spent the last three days trying to reset my body clock instead of doing anything interesting. I’m very pleased with the transparency inside of Google. I have yet to find a door which my keycard won’t open or a website which I can not access with my login. Of course I can’t tell anyone outside of Google what I have found out which is annoying, there is a lot of cool stuff going on. Having worked mainly for small companies in the past, it’s nice to be able to walk into TechStop (Google’s tech support department) and get both hardware and support. It’s nice having small things like beverages (such as that all important coffee) and food provided. The food in the Sydney office is not bad, but it pales in comparison to the variety and quality that you get here at the Googleplex. I have heard that people worry that with all the food at Google you just end up going to lunch with your work mates, I don’t think that is something having food provided creates. At the my previous work I ended up in that situation, always having lunch with the same people at the same locations, the only difference is that I was paying for it! Google is liberal about letting you invite friends to have lunch at their free cafeteria’s too. Over all, it has been a very busy and interesting week. I’m looking forward to what tomorrow (and the rest of this week) holds. Google Summer of Code on again! Leslie Hawthorn has announced that the Google Summer of Code is on again. Like, nobody saw that comming! Hopefully, Thousand Parsec will be a mentor organisation again. Have to keep those southern hemisphere mentor numbers up! 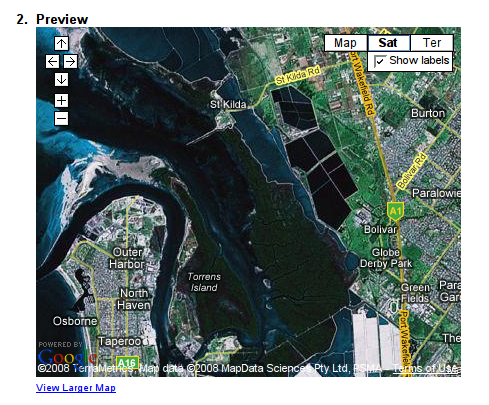 I live in Adelaide and have been playing around with Google maps recently. I have no sense of direction which makes Google quite useful for getting to places. 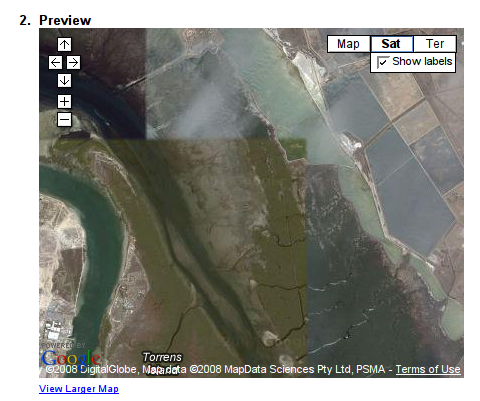 It appears that Google has some problems with satellite images for South Australia. If you take a look at the map below, you should see that it is built out of three totally different captures, you can even see a few clouds. I wonder how they decided what data to use?